Heal Your Puzzle » Blog Archive » What is Your Life’s Bigger Picture? What is Your Life’s Bigger Picture? At this time of year, I feel the urge to refocus my goals and reinvigorate or start new projects. Have you given up on goals for this year? 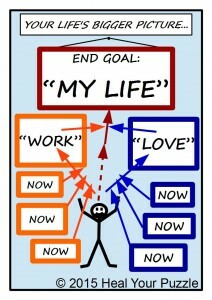 Do you still feel driven by a personal goal that currently is not in your life? Do you feel that your relationships do not feel complete? Do you feel dissatisfied with how your life fits together? One way to give yourself clarity about your ‘Now’ and how you move forward is to imagine a picture for each part of your life as it is NOW, such as ‘Money’, ‘Family’, ‘Work’, ‘Interests’, or perhaps each of your relationships:- ‘Friends’, ‘Family’, ‘Work colleagues’, ‘Children’, ‘Mum & Dad’ and so on… Begin to see them as different pictures that you step into and out of as necessary (the smaller ones in the diagram); these represent your NOW. Begin to see where pictures are separate and also where they interact – maybe try to draw them? Do any of your pictures clash – either not enough time for both or one limits the other? Is one or more pictures a problem? Which ones are not yet clear? Moving Forward… When you start looking at your own ‘pictures’, you may become aware of a number of paths, more than one bigger picture, for example: one for ‘Work’, one for ‘Love’, maybe more? Already you will feel more clear and more aware of your next step 🙂 And continuing the process will bring “Your Life” Big Picture closer. At each stage, the pictures will need to become more coherent with each other before moving forward again. Already in your Big Picture? …Really? !